Al-Quds Day, held annually on the last Friday of Ramadan, is an international day of solidarity with Palestinians. Quds is the Arabic name for Jerusalem. The commemoration originated in 1979 in the Iranian revolution that overthrew the Shah of Iran–who in accordance with his US allegiances was an ardent supporter of Israeli colonialism. Regardless of reactionary political developments in Iran since then, Al-Quds Day remains a powerful international day of solidarity with Palestinian self-determination & the heritage of a revolution that overthrew the murderous Shah. There have been several protests reported around the world & there is one in London today. 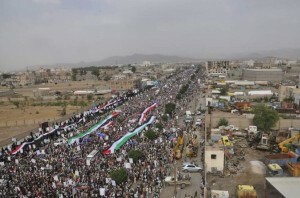 This is a photo of the Al-Quds protest in Sana’a, Yemen last Friday. 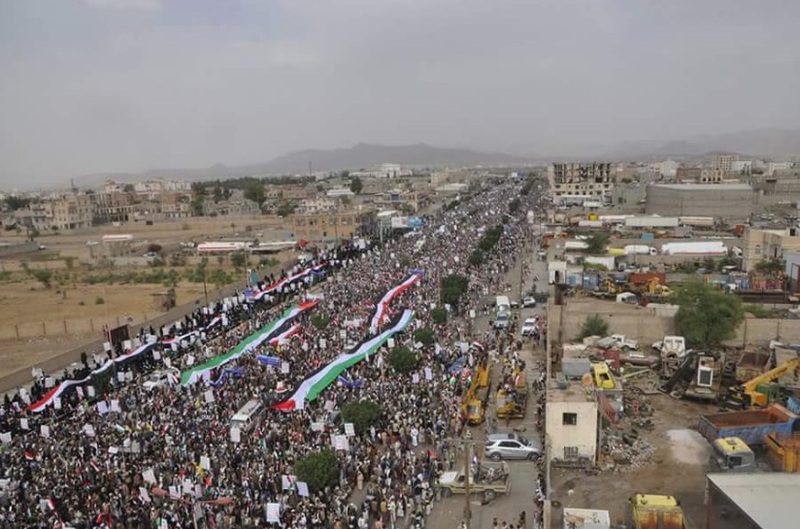 What makes it so remarkable is not just the size reflecting massive solidarity with Palestinians but that Yemen remains under aerial bombardment by Saudi-led, US & UK-backed warplanes. Those around the world who stand with justice stand with Palestinians & with the people of Yemen whose enemies are the opponents of justice around the world. It’s difficult to keep up with the avalanche of terrorist attacks around the world. Barely has the smoke cleared in Istanbul when they strike again in Dhaka & in Baghdad. It’s impossible to unravel reality from war mongering in the media reports of what happened & who is responsible. One can see where false flag explanations get their appeal because often the stories don’t add up or are simple-minded. Those terrorist attacks cannot be isolated from US bombing terrorism in Afghanistan, Iraq, Syria, Pakistan, Somalia; from Saudi-led, US & UK-backed bombing in Yemen; from Russian & Syrian bombing in Syria; from Israeli bombing of Gaza. By isolating suicide bombings & making them the story, we turn attention from those monstrous wars which are the context generating individual acts of terrorism. That is not to excuse terrorism but to understand its political genesis in desperation.